Yes! You Can Finally Shop from New York Fashion Week! Ahhh, New York Fashion Week is here! NYFW is always filled with anticipation to see which lovely (and sometimes curious) looks conceptualized by brilliant designers are brought to life on the runway. The fashion world is all a-buzz during this hectic two weeks of industry giants coming together for back-to-back fashion shows. Fall 2016 or Spring 2017? Which Is It? Traditionally, in the fashion industry, semi-annual fashion week shows feature designer collections – that is, collections that are actually for future seasons. For instance, collections featured in September are for the following spring season, and collections shown in February are for the following fall season. So right now, for the most part, we're mostly seeing designs that will be available for purchase in Spring/Summer 2017. So what if you happen to fall in love with those looks but you're not able to buy them for another 6+ months? You either forget about them or might not be interested in them anymore when spring rolls around – at that time you'll be looking at the upcoming fall collections that are on the runway! This is both confusing and frustrating for the consumer as well as retailers. Earlier this year, a handful of top designers: Rebecca Minkoff, Tom Ford, and Burberry announced that they were going to essentially ‘buck the system' and start showing collections that were are available to the market immediately after the show. This ‘See Now, Buy Now' concept is rocking the fashion world right now – in a long, overdue, and much-needed way. I respect game changers such as these designers who are going against the grain and reverse-engineering their antiquated design/production processes to finally meet the desires of the consumer. In a recent fireside chat with Ken Downing, Fashion Director of Neiman Marcus, he expressed deep frustration with not being able to give his customers what they see on most runways at that time. He urged designers, fashion editors, retailers and stylists to feature timely looks that match up with the current season. Makes total sense, right? In line with this, I'm not going to highlight any Spring 2017 looks today, but instead will share a few awesome looks that came off a few ‘See Now, Buy Now' runway shows. This is a special treat for you because you don't have to wait to purchase items you love – you can hit the stores now! I'm featuring new ‘Buy Now' looks from Rebecca Minkoff, Misha Nonoo, and Tom Ford. FYI, just to keep it real, the looks from Rebecca & Misha are definitely in the ‘more affordable' range compared to Tom Ford's looks. 😉 I hope you enjoy some of the looks, get inspired for fall, and maybe even do a little bit of shopping at the same time! This is Look #11 from Rebecca Minkoff's recent NYFW show. 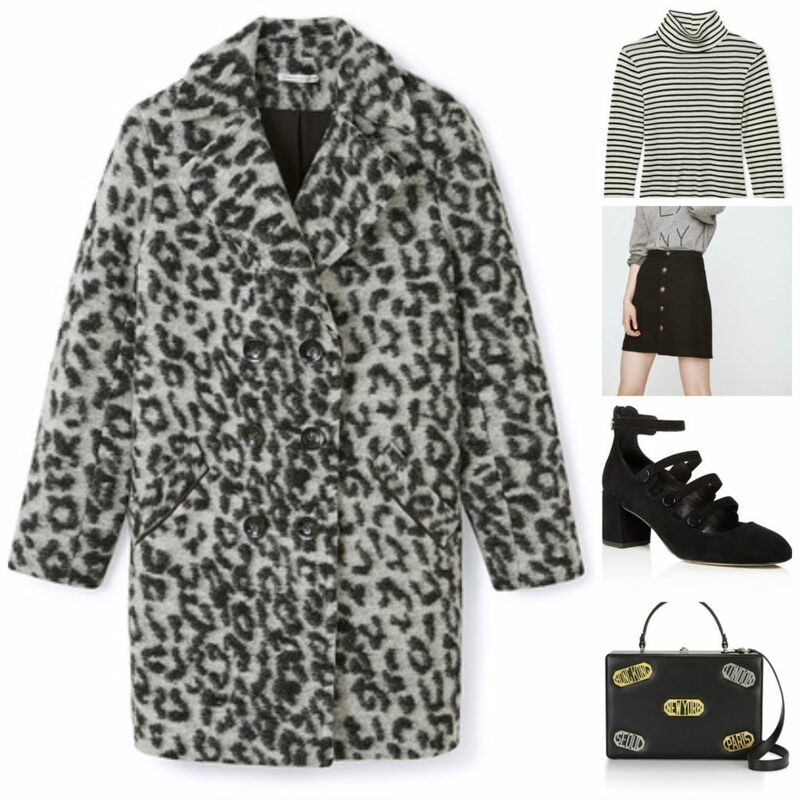 I love this look because of its fun, yet chic leopard print overcoat that's nicely balanced by a fitted A-line skirt, comfortable striped turtleneck, suede midi-heeled Mary Janes, and an oh-so-cute luggage-style purse! The prints on the coat and turtleneck play off of each other nicely and really make the ensemble very interesting to look at and wear! Next up are a couple of hot new items from Misha Nonoo's current Fall 2016 collection. 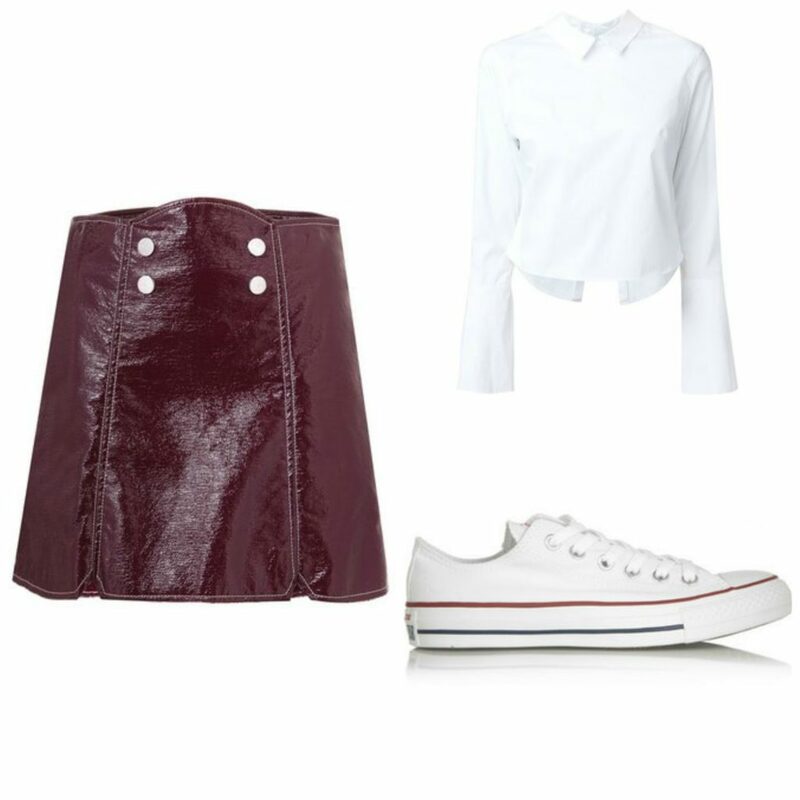 This look features her statement berry-colored Vivienne skirt that I paired with her crisp, white Claire shirt. (Remember a little birdie told you that you'd be seeing berry colors trending this fall?) You'll notice that I threw in a pair of classic Converse Chuck Taylors to bring a bit of ‘street' creating a fun Hi-Lo style. Last but not least, I wanted to share some lovely pieces that just came off of Tom Ford's runway and are available to buy now (for those of you that really want to splurge!). Tom Ford's design always seem to both mesmerize and delight. Since he has so many awesome looks available, I couldn't pull together just one look for you. I, too, splurged and highlighted my most favorite pieces for you to enjoy! While there are still several more days of fashion week remaining, I hope you enjoyed this quick preview of looks from forward-thinking designers that have you in mind. If you love these looks and want to incorporate similar styles into your wardrobe, contact me to get started!